St. John Gualbert, son of the noble Florentine Gualbert Visdomini, was born in 985 (or 995), and died at Passignano, 12 July, 1073, on which day his feast is kept. He was canonised in 1193. The story of his conversion is related as follows. One of his relatives having been murdered, it became his duty to avenge the deceased. He met the murderer in a narrow lane and was about to slay him, but when the man threw himself upon the ground with arms outstretched in the form of a cross, he pardoned him for the love of Christ. On his way home, he entered the Benedictine Church at San Miniato to pray, and the figure on the crucifix bowed its head to him in recognition of his generosity. This story forms the subject of Burne-Jones's picture "The Merciful Knight", and has been adapted by Shorthouse in "John Inglesant". John Gualbert became a Benedictine at San Miniato, but left that monastery to lead a more perfect life. 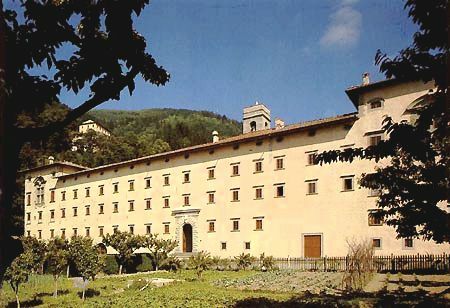 His attraction was for the cenobitic not eremitic life, so after staying for some time with the monks at Camaldoli, he settled at Vallombrosa, where he founded his monastery. Mabillon places the foundation a little before 1038. Here it is said he and his first companions lived for some years as hermits, but this is rejected by Martène as inconsistent with his reason for leaving Camaldoli. The chronology of the early days of Vallombrosa has been much disputed. The dates given for the founder's conversion vary between 1004 and 1039, and a recent Vallumbrosan writer places his arrival at Vallombrosa as early as 1008. We reach surer ground with the consecration of the church by Bl. Rotho, Bishop of Paderborn, in 1038, and the donation by Itta, Abbess of the neighbouring monastery of Sant' Ellero, of the site of the new foundation in 1039. The abbess retained the privilege of nominating the superiors, but this right was granted to the monks by Victor II, who confirmed the order in 1056. 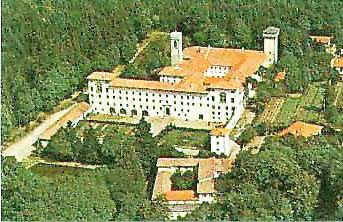 Two centuries later, in the time of Alexander IV, the nunnery was united to Vallombrosa in spite of the protests of the nuns. The holy lives of the first monks at Vallombrosa attracted considerable attention and brought many requests for new foundations, but there were few postulants, since few could endure the extraordinary austerity of the life. Thus only one other monastery, that of San Salvi at Florence, was founded during this period. But when the founder had mitigated his rule somewhat, three more monasteries were founded and three others reformed and united to the order during his lifetime. In the struggle of the popes against simony the early Vallumbrosans took a considerable part, of which the most famous incident is the ordeal by fire undertaken successfully by St. Peter Igneus in 1068. Shortly before this the monastery of S. Salvi had been burned and the monks ill-treated by the anti-reform party. These events still further increased the repute of Vallombrosa. St. John adopted the Rule of St. Benedict but added greatly to its austerity and penitential character. His idea was to unite the ascetic advantages of the eremitic life to a life in community, while avoiding the dangers of the former. Severe scourging was inflicted for any breach of rule, silence was perpetual, poverty most severely enforced. The rule of enclosure was so strict that the monks might not go out even on an errand of mercy. The main point of divergence lay in the prohibition of the manual work, which is prescribed by St. Benedict. St. John's choir monks were to be pure contemplatives and to this end he introduced the system of lay-brothers who were to attend to the secular business. He was among the first to systematise this institution, and it is probable that it was largely popularized by the Vallumbrosans. The term conversi (lay brothers) occurs for the first time in Abbot Andrew of Strumi's Life of St. John, written at the beginning of the twelfth century. The Vallumbrosans do not, strictly speaking, form a separate order, but a Benedictine congregation, though they are not united to the confederated congregations of the Black Monks. The oldest extant MS. of the customs of Vallombrosa shows a close relationship with those of Cluny. The Vallumbrosans should be regarded only as Benedictines who followed the customs observed at that time by the Black Benedictines throughout Europe. "Horror of simony was a special bond between them and Cluny, and it was only special circumstances which caused them later to be looked upon as a peculiar institute within the Benedictine order" (Albers). The habit, originally grey, then tawny coloured, is now that of the Black Monks. The abbots were originally elected for life but are now elected at the general chapter, held every four years. The Abbot of Vallombrosa, the superior of the whole order, formerly had a seat in the Florentine Senate and bore the additional title of Count of Monte Verde and Gualdo. Shortly after the founder's death, we find attached to the monastery of Vallombrosa lay sisters who, under the charge of an aged lay brother, lived in a separate house and performed various household duties. This institute survived for less than a century, but when they ceased to be attached to the monasteries of monks, these sisters probably continued to lead a conventual life. Bl. Bertha (d. 1163) entered the Vallumbrosan Order at Florence and reformed the convent of Cavriglia in 1153. St. Umiltà is usually regarded as the foundress of the Vallumbrosan Nuns. She was born at Faenza about 1226, was married, but with the consent of her husband, who became a monk, entered a monastery of canonesses and afterwards became an anchoress in a cell attached to the Vallumbrosan church of Faenza, where she lived for twelve years. At the request of the abbot-general she then founded a monastery outside Faenza and became its abbess. In 1282 she founded a second convent at Florence, where she died in 1310. She left a number of mystical writings. In 1524 the nuns obtained the Abbey of S. Salvi, Florence. There are still Vallumbrosan nunneries at Faenza and San Gimignano, besides two at Florence. The relics of Bl. Umiltà and her disciple Bl. Margherita are venerated at the convent of Spirito Santo at Varlungo. The habit is similar to that of the Benedictine Nuns. Badia a Passignano Info Copyright © ammonet InfoTech 2001 - 2018. All rights reserved.